There’s nothing quite like heading out to the pool after a long day at the office and lounging with an ice cold drink. It’s a wonderful way to relax in the comfort of your own home. How can you enjoy your new pool in a little peace and quiet? There are two answers that will not just give you privacy, but increase security and enhance the look of your property. There’s a reason you decided to have a pool installed on your property instead of joining the local swim club. Gawking and noisy neighbors can ruin the relaxing atmosphere of a home pool, so you need a way to protect your privacy. Maryland has laws requiring pool fencing in most situations, so you may already need to plan a fence into your new build. Pool fences can be made to not just keep small children and pets out of your yard, but they can give you enough privacy to enjoy your pool in peace. Landscaping at the edges of your property can help soften the hard line of a fence and make it look more natural. Trees, large grasses or shrubs can work with your fence to create a property line that looks great from both sides and offers plenty of privacy and protection. From pool houses and enclosures to water slides, Rhine Pools can help realize your vision of the perfect backyard. One of the secrets to the success of Rhine Pools is that we’re all inclusive. Clients deal with one project manager and receive answers and feedback from this person. There aren’t dozens of people and faces to remember. 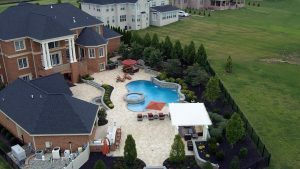 Instead of being narrowly focused on just the pool, many of our designs also include patios, decks, shade structures, fireplaces, outdoor kitchens, water features, plantings, lighting, and more. All of these elements are incorporated into a cohesive plan that is the basis of a successful project. 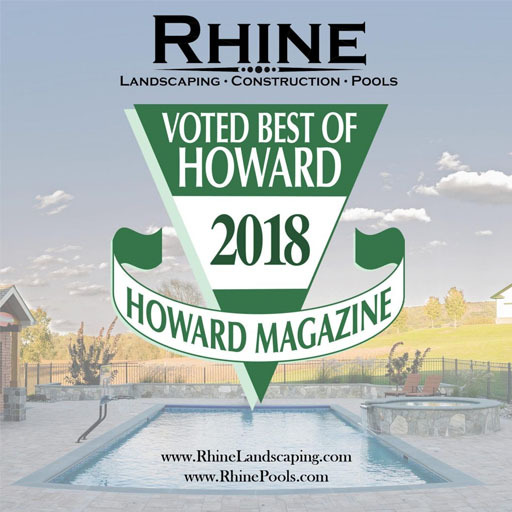 Serving Montgomery County, Howard County, and Baltimore County for all of your Swimming Pool, Construction, Landscaping, and Masonry needs.